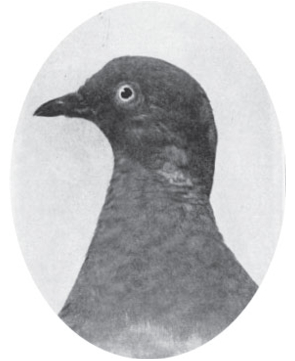 Martha, the world’s last passenger pigeon. A century ago this month, the world’s last passenger pigeon (Ectopistes migratorius) died in the Cincinnati Zoo, long after the last passenger pigeon had been seen in the wild. The passenger pigeon, once populous beyond imagining, took only a century to disappear. It seems that more than one factor was responsible for the population decline and how well the passenger pigeon thrived, from breeding habits (they bred communally in large flocks, and didn’t breed in captivity) to human influence (hunting, habitat loss and deforestation). To a 19th-century European hunter sitting in the middle of a vast colony of the birds, though, it must have seemed like endless flocks of passenger pigeons were just the way of the world. When the first alarms were raised, including an 1857 bill in Ohio to control hunting and protect the birds, the overall response was simple disbelief. “The passenger pigeon needs no protection. Wonderfully prolific, having the vast forests of the North as its breeding grounds, traveling hundreds of miles in search of food, it is here today and elsewhere tomorrow, and no ordinary destruction can lessen them, or be missed from the myriads that are yearly produced.” (Wikipedia) Subsequent efforts over the next 40 years were fruitless. And so to the declines in the shorebirds of the Eastern Hemisphere, epic migrations that take place between Australia and the Arctic along the eastern coastlines of the Pacific Ocean and along the Yellow Sea. An estimated 36 bird species, their populations numbering in the hundreds of thousands, have used the flyway for most of human memory. Their numbers are dwindling. Very quickly. Some species, including the curlew sandpiper, have seen their numbers collapse by up to 95% over the past few years alone. The culprits? Hunting, habitat loss, deforestation. And yes, there are several international agreements in place meant to protect migratory birds and their habitats. It would seem the people doing the agreeing and the people doing the hunting and developing don’t share common goals. Or maybe the hunters and developers and those who support their right to action just don’t believe in extinction. Remains of the last confirmed wild passenger pigeon, shot by a boy with a BB gun in Ohio, March 1900. When will we, then the marshes, and finally the shores, begin to forget the last shorebird? Or have we already begun?